Prime KO to offer pre-paid Shabbat meals starting in June | Thanks a Glatt! Prime KO, just announced via their Facebook Page and twitter account that they will be offering pre-paid Shabbat meals at the restaurant starting Friday, June 4th. The Friday night meals will include 3 courses and an open wine bar for $65 per person. Seating begins at 8:30pm. They will also offer late night desserts and wine for $35 from 10:30pm – 2:00a, for people 21 and older. 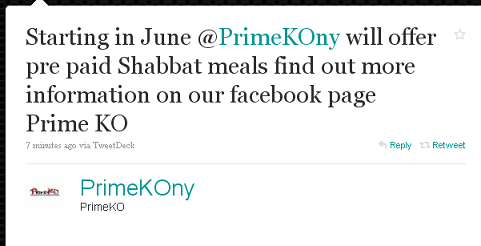 Reservations can be made by calling the restaurant directly at (212)496-1888 or via email at shabbatclub@primekony.com.